Urgup is a town in Central Turkey that I visited in 2009 with a Turkish friend I had met the previous year on my first solo visit to Istanbul. Mehmet worked in the tourism industry so he made all the arrangements for a two-day tour of Cappadocia with our base in Urgup. 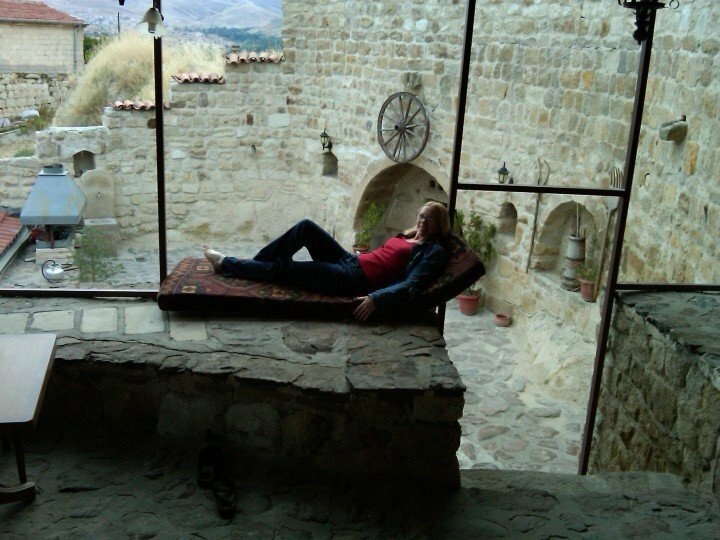 Although solo travel is my preference and I enjoy the process of planning my trips I must admit I enjoyed having someone else take care of all the travel arrangements for this weekend getaway from Istanbul. We arranged to spend one extra day in Urgup so that we could explore the town at a relaxed pace after the two days of organized tours in Cappadocia – which were amazing! I definitely plan to return to Urgup and the Cappadocia region to spend more time exploring and hiking the area. 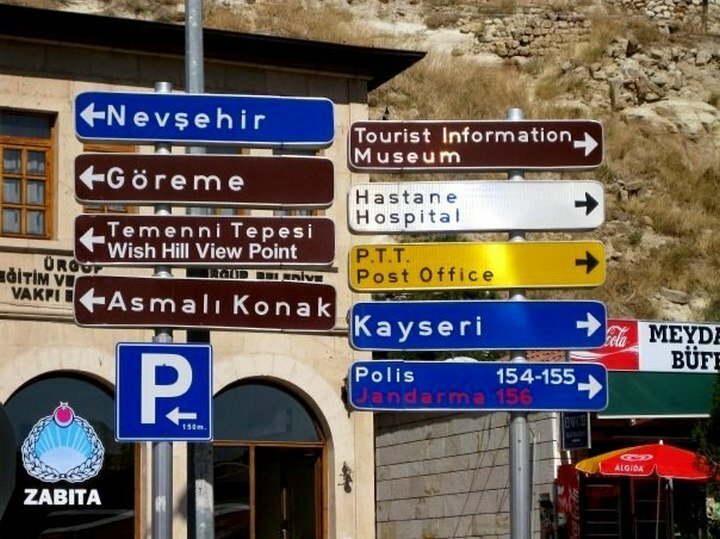 The Dedeli Konak Cave Hotel is in central Urgup so it’s a nice walk to the central plaza. 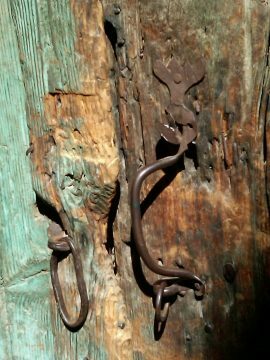 Walking around the nearby streets I saw many beautiful doors with such character I put together the collection in my previous post doors of Urgup. 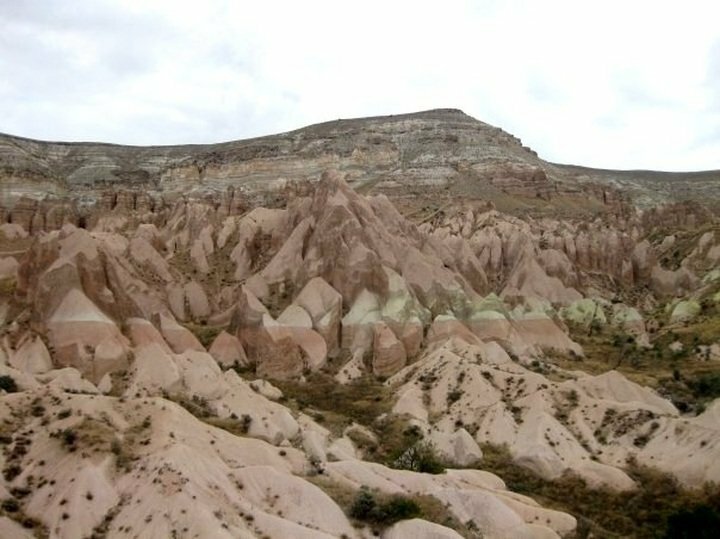 Urgup is located in the Central Anatolia region of Turkey and this is wine country. 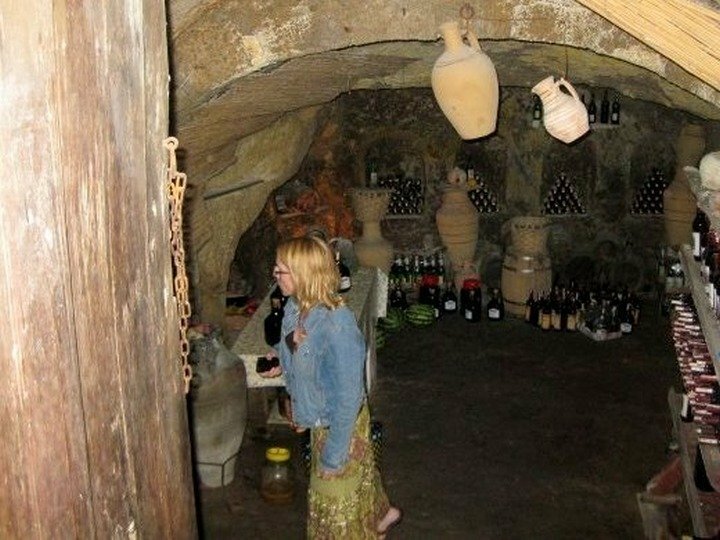 We stopped by Mahzen Sarap Evi – a little wine shop where a joyful woman showed us around the shop. 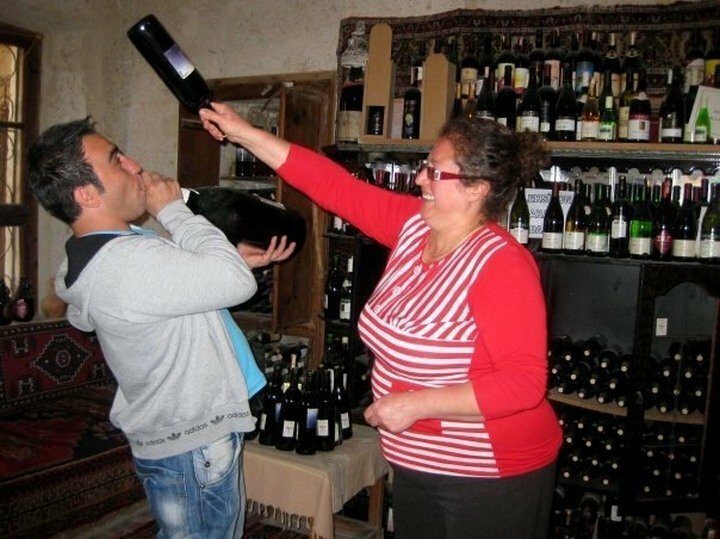 The wine merchant had a great sense of humor as you can see in the photo below – Mehmet is about to drink her collector’s vintage wine and she’s pretending to bop him on the head with a bottle of wine. Although 586 years passed, People of Ürgüp did not forget Aslan Gazi, who became a martyr because of his ideals for the independence of Seljuk Empire against the Mongolians. 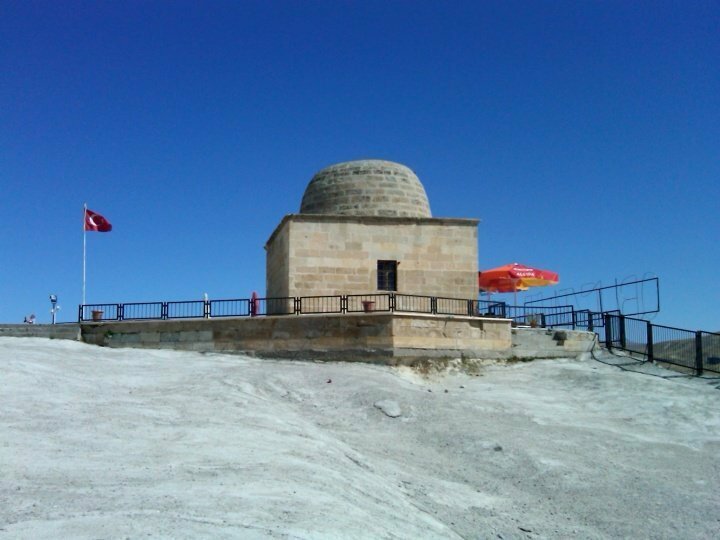 To the memory of him a tomb was built by the help of Kayseri Mayor Vecihi Pasa in 1852. The word “Temenni” given to the hill where you are now means “sacred area, sacrificial area or pray land” in the Sumerian, that gives an idea about the age of the place. 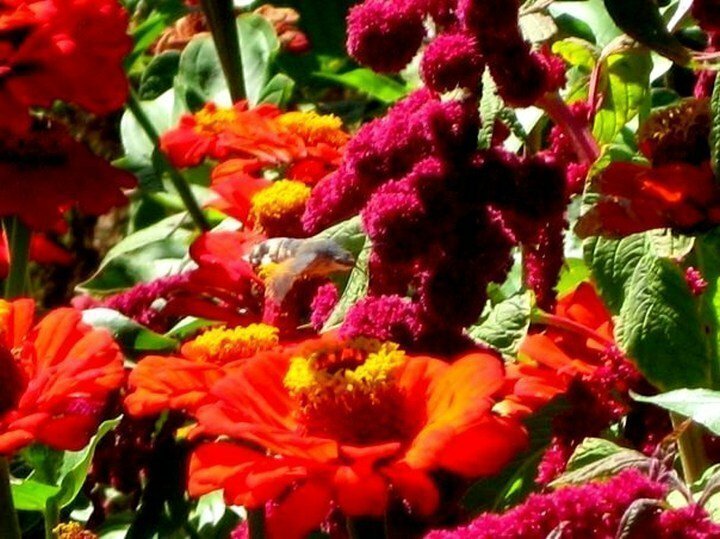 Atop Temmeni hill there is also a beautiful flower garden – we spotted several hummingbird moths collecting nectar from the vibrant blooms. After walking around we stopped for lunch and also enjoyed a lovely surprise – foot massage! For only one Turkish lira I enjoyed a fabulous two-minute massage at the sidewalk massage machine – it was cool and I wish they had these magical massage machines in every city. 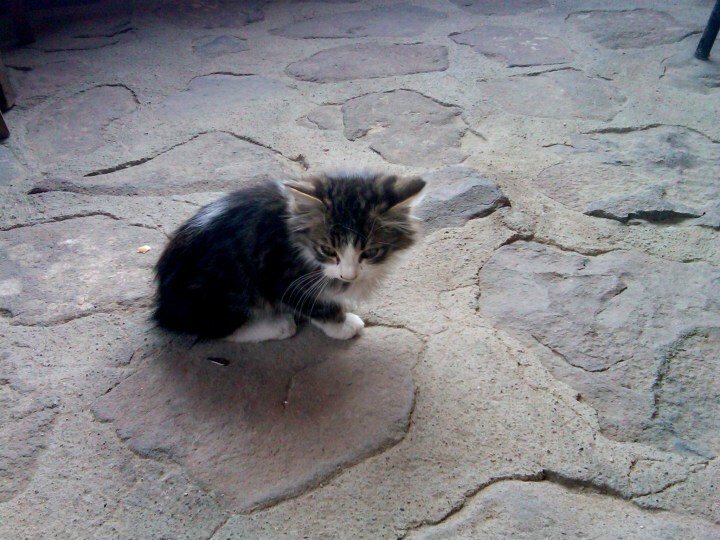 Another cute surprise was the little kitten that visited us each morning at the Dedeli Konak Cave Hotel on the terrace. So adorable! We enjoyed breakfast on the terrace in the morning at Dedeli Hotel as well as a fabulous lunch buffet on our second day of touring around Cappadocia. I have fond memories of visiting Urgup and I look forward to returning again to explore the area and hike around Cappadocia. What travel destination would you love to return to again? Lovely photos and interesting stories. My favourite travel destination will always be Norway, any place in Norway will do! I have seen New Zealand and especially the South Island reminded me of Norway. Only Norway is older, it has a history which goes back to before our era, while NZ can only show a history from about 900 AD when the Maoris arrived. There are no human traces before that time. Great Britain is also a country I will choose for my travels. Hi Wil, Thanks for your thoughtful comments. I haven’t been to Norway but I know I will love it – the hiking is sure to be outstanding! I must admit to being quite ignorant of Norway’s history – I shall have to remedy that! I have a friend in Norway – that I met on this trip to Turkey actually – and I would love to go visit with her in Oslo and travel around Norway. – must make a plan! 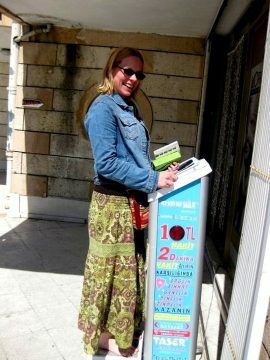 Turkey is a country I plan to explore more – it is fascinating and the people are very welcoming. Your trips always seem so fascinating. Beautiful pictures of a place I would love to visit too. Where would I like to go back to?? Oh my, so many places. But the best would be Kenya. My heart is really there with the Maasai people. I would also love to return to Israel….well I could go on and on. Thanks for sharing your trips with us. Thank you for stopping by! Like you my list of places I would like to return to is long. Both Kenya and Israel are places I have yet to visit – I have only read other peoples travel stories – looking forward to getting there one day. The list of places to visit keeps growing! Wonderful historical trip. There is lot to see. 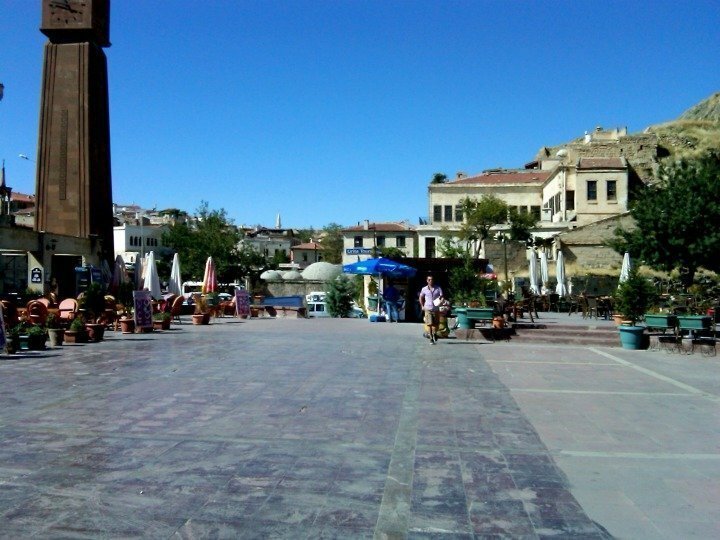 Yes – I need to go back to see more of Turkey! Wow! I never would have thought that Turkey would be so beautiful. 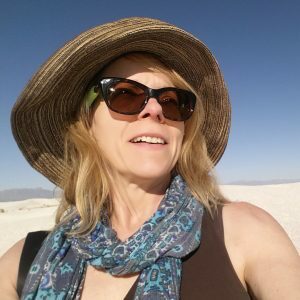 I love reading your posts about your trips and seeing your photos – I love to travel, but unfortunately, it seems that other things take precedence for the $$$. If I could return to one place I’ve visited already, it would be Wales – I really would love to see the coastline and go to the north to see where my paternal grandmother was born – Llandudno – apparently it’s quite the seaside resort town now! Yes, Turkey is absolutely beautiful! I’ve only seen a small bit of it so far but plan to go back to explore more of the country – I could spend months there! I’ve only seen photos of Wales – the coastline is gorgeous and the hiking around Wales and the UK in general looks to be idyllic. Hope you get back to Wales and Llandudno! I’m always impressed with your travels and how adventurous you are. We are looking forward to returning to England this summer just hubby and I this time around. Hi Ellen! I do have a bad case of the wanderlust and never-ending curiosity of other cultures and places. England will be wonderful in the summer – hope you and hubby have a grand time!! Relaxed, indeed. as the shopkeeper will be if that bottle hits him! HI Susan, we’ve been to Urgup and Cappadocia, fascinating places, Cappadocia reminds me of a space odyssey.. We’ve travelled widely around Turkey it is a most beautiful country. Konya is a fascinating place with the museum that holds the world’s smallest Koran. The most spectacular site I think is Ephesus, don’t know if you’ve been there but well worth a visit! Wonderful! Thoroughly enjoyed :) Thank you Susan! Thank you Amit – glad you stopped by!